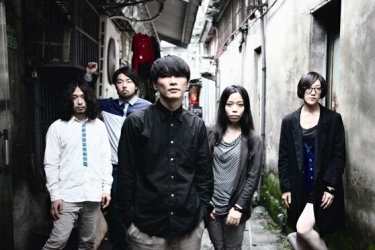 Sakanaction’s 4th album “kikUUiki.” The album – titled for the phrase coined to describe the place where fresh water and sea water mix – is dance, electronic, progressive, and guitar rock. It’s a title that gives you a feeling for the identity of the people creating this rare musicianship, fusing pop and dub. The same is true of the contents of the album. The natural fusion distinctive of the band is fully developed in each song. Now that their newest single, “Aruku Around,” has gained success as for ranking 3rd on the Oricon charts and the group has gained the popularity that goes with that, what will they give us next? We spoke with the group’s vocal and guitar, Yamaguchi Ichiro. We demolished the deadline (laugh), but were able to create a work we have confidence in! --What do you think of your work now, when you re-listen to it? Yamaguchi: We were aiming to create an album that had “Sakanaction-ness,” and I think we were able to present something in that neighborhood. Until now we were in the midst of constructing the band’s style. When we came to this album’s title, it occurred to us that “in truth, we’re discovering good things by blending.” Combine that with objectivity, and what we were searching around for was this album. Yamaguchi: There are five members, two of which are women. We had been gathering together to create our songs, but with the previous album, “Shinshiro,” we really experienced the album and were able to appreciate it. On this album we saw the things each of us wanted to do and analyzed them with the thought of “Why is it this way?” and brought it all together. Thanks to all of you, we’ve demolished the deadline 4 times (laugh), and have been able to create a work we have confidence in. --And this time you took a bigger role producing, too. Yamaguchi: You could say that until now our composition process and playing were incompetent. This album in particular seized us objectively, because we aimed at “playing what we want, without losing popularity.” To that end, we changed the way we had worked up until that time. --How are you working now? --Was it difficult to achieve that coexistence, which could also be called polarity? Yamaguchi: While there were limitations, to the extent we were able to put out something interesting that reflects our identity, it was pretty close to pop art. It’s important to have fun, and there was trial and error: good and bad, like and dislike. We’re a band and therefore people that capture rock, but despite being a band, when we discover this kind of interest in musicality and don’t settle into a format, it’s a good thing. Because on the other hand, it can capture our anxiety as well. --What have you found with this stance? Yamaguchi: We explored our standards, and what we found was a “good discomfort.” I am constantly acting as the axle, and we’d remember things like “If the melody and words slowly come together, we can create a fusion that’s not mismatched,” and “Even while creating ‘good discomfort, listening to the song is our foundation.” The foundation is that we’re playing to deliver to people, and yet we also use easy to deliver gimmicks. We discovered that dimension of ourselves all over again. --And you added that into this album. Yamaguchi: With “Aruku Around” we were able to offer Sakanaction’s standard presentation, and from there we’ve asked people what kind of music they want to hear next, and if they want “good discomfort,” because that’s where this album’s meaning is. This album’s lead song is the 7-minute long “Me ga Aku Aiiro,” but it has a feeling of “This made it on the album! ?” doesn’t it? --This is the last song on the album, and it’s a big musical selection that includes many various components. Yamaguchi: After having the idea for 9 years, I’ve been finally been able create the embodiment of the sound in my head. Of course this was made as a recording compilation, and this is a composition with the power to tell you what this album is all about in a single song. --It’s a song that makes you feel the dynamic flow from night, to deepest night, to dawn, to morning. Yamaguchi: It’s a meaningful composition, and I want to question the scenes with various meanings. Not just by changing the arrangement; even regarding the words, various rhetoric is being highlighted, and there are new discoveries and perceptions each time you listen. While “Aruku Around” presents a dance rock that’s easy for most people to understand, we took a different approach with the album. It’s the breadth we achieve from that is what we’re really anticipating. --Finally, tell us where to listen to this album. Yamaguchi: We prepared various hooks, including poison ones, and as you get different impressions listening to it over and over I think it becomes a more interesting work. It makes me happy when listeners can convey the scenes they create as they listen to this. It’s not the artist that gives birth to good music, but the listener.